Chip is a stuffed chipmunk from our Mini Flopsies collection that would love to call your nearby tree home. In fact, he would love to call your home, home. 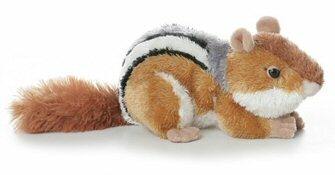 With soft light brown fur, white, black, and gray stripes, and a large fluffy tail, this little Mini Flopsies stuffed chipmunk would feel right at home anywhere in your house. He really does make a wonderful pet.